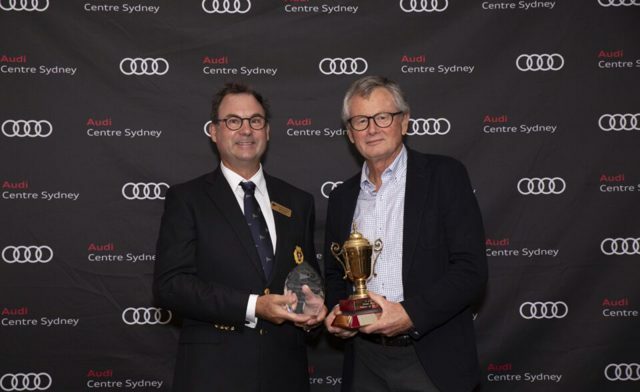 Legendary sailors Matt Allen and Wendy Tuck have headlined a long list of winners at the Cruising Yacht Club of Australia’s annual gala function to herald a new round of Ocean Racer of the Year recipients and acknowledge the champions of the Club’s 2018-19 Audi Centre Sydney Blue Water Pointscore Series. Dinah Eagle is an 11-time Rolex Sydney Hobart crew person and key member of the Wax Lyrical team. At sea Dinah drives, trims and is a watch leader, as well as cooking, sail packing and anything else to keep the boat racing fast. Her nominee describes her as a team player and a patient mentor to the less experienced team members. The CYCA Ocean Racing Navigator of the Year was instituted in 2008. The 2019 recipient Will Oxley is one of the world’s leading lights in yacht race navigation and an integral member of Matt Allen’s highly successful TP52 Ichi Ban campaign. Oxley is a major contributor to the success of the current and previous Ichi Bans and outside of this role he shares his vast knowledge writing books and articles which concentrate on race navigation. Awarded to an owner campaigning their own boat within the CYCA’s prestigious Blue Water sailing program for the first time, this West Australian owner undoubtably has the best themed Blue Water entry – Anthony nicknamed Captain Kirke and his boat called Enterprise, from the popular original series of Star Trek. Over the past season Kirke organised a remote operation from the west coast, and with his WA crew outperformed as east coast rookies onboard Kirke’s Farr 40. Awarded to a stalwart of the sport, Melbourne’s Bruce Taylor is a longstanding and fierce competitor who most recently trumped the fleet overall in the Noakes Sydney Gold Coast Yacht Race with his Caprice 40 called Chutzpah. His current Chutzpah is the sixth in the series of boats by the same name and with previous generations he’s earned multiple top three places in the Rolex Sydney Hobart. Taylor knows how to build a team and his core crew have stuck by him for decades. Inseparable after both enjoyed outstanding years on the water, Matt Allen and Wendy Tuck share the Ocean Racing Yachts Persons of the Year – Tuck the first female winner of the award. Allen won myriad events across the period including the Audi Centre Sydney Blue Water Pointscore, IRC and ORCi at the Australian Championships and the 2018 Festival of Sails, and an overall win and a race record in the Brisbane to Gladstone. Tuck enjoyed a year to remember, claiming the 2018 Australian Female Sailor and Offshore Sailor of the Year awards, a Rolex World Sailor of the Year nomination and Honorary Membership of the CYCA after winning the 40,000-mile Clipper Round the World Yacht Race. Tuck was unable to attend the event, currently sailing in the Indian Ocean on board Maiden Factor on her way to Fremantle.